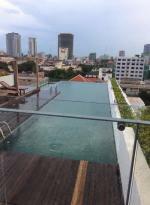 Massive luxury villa set on 800m2 of land in central Phnom Penh. Ideal for a professional family or ambassador relocating to Cambodia. This fully furnished oasis in the city features 4 bedrooms, 6 bathrooms and a private staff quarters.